Are You Living in Overwhelmsville? When you look around your office, what do you see? If you’re like most business leaders, you probably see so much to do that you don’t know what to do first. There’s a leaning tower of papers on the desk, a stack of email in the inbox, a puddle of unopened envelops on the floor next to your desk. It’s overwhelming. And not knowing how or where to start can completely drain your motivation to do anything. I’m in the middle of updating—okay, more than updating, substantially remodeling—my 1930's house. I love the place, and when I bought it, I had a wonderful vision of what it would be once my remodeling project was finished. Unfortunately, when I stood in the middle of the living room floor and contemplated how to start, I hadn’t the foggiest clue of what to do first. My vision of the completed house was strong in my mind, and yet all I could see when I looked around was a pile of projects that each led to another project that led to another that led to another that led…. I was getting a terrible sinking feeling in my stomach (that one between panic and despair) when my reeling eyes snagged on a defunct light switch. “Ah-HAH!” I thought. “This I can do. I can rewire this one switch.” I found my screwdriver and went to work. A few minutes later, I flipped the switch. Light! And with that light came the energy I needed to overcome my confusion and panic and get moving. 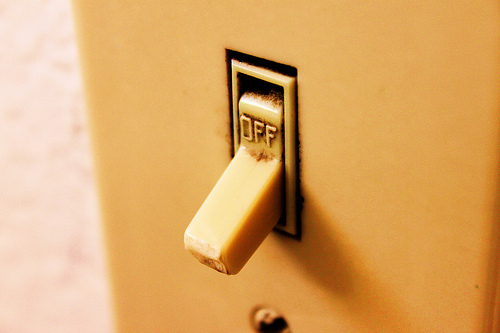 Somehow that one action—rewiring the light switch—restored my own internal energy circuit. Afterwards, I was able to look around the room and see things I could do to move my project forward. I suddenly saw the project as possible, and I no longer existed in a state of panic and defeat. The key was in choosing something I could complete quickly and that had a high probability of success. I was confident I could rewire that light switch, and when I did, I got a surge that allowed me to move forward and tackle bigger problems confidently. I didn’t try to take on a complete rewire of the house—something that big and complicated would have inevitably failed, leaving me feeling just as daunted and overwhelmed as I was when I started. But tackling just that one switch was the perfect small step to propel me out Overwhelmsville and back into Productivity Land. I’m happy to report that, ultimately, a complete rewire of the house did take place. Because I was able to see clearly how to complete the project, it went smoothly, with much less stress and fewer mistakes. I was motivated, confident, and excited—all because one little light switch restored my confidence in my ability to move forward. What project are you procrastinating about? Identify the tiniest thing you can complete on that project in a relatively short period of time.